Embark on an all inclusive family vacation you’ll never forget, at Beaches Negril all inclusive resort & spa. Nestled on one of Jamaica’s most pristine stretches of beach, this all-inclusive resort enchants with soaring trees, clear turquoise water, and that unmistakable island spirit. Unforgettable fun awaits the whole family, thanks to Beaches resorts included water and land sports, variety of restaurants, and service that always puts you first. We love sending our clients to Beaches resort properties — we know they’ll have an incredible vacation full of memory-making moments! Soft, sugar-fine sand greets you at this Jamaican beauty of a beach. Stick your toes in the sand and lounge for a while … or don some snorkeling gear and explore the refreshing turquoise waters! 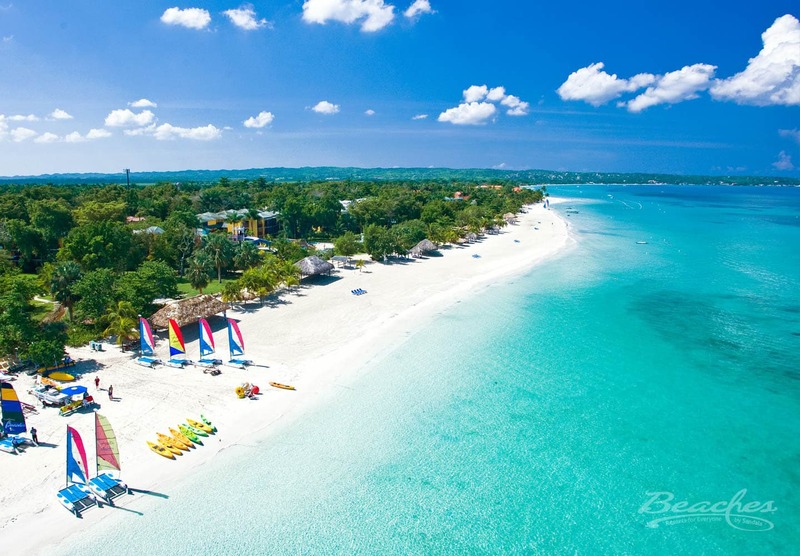 Seven-Mile Beach is home to some of the clearest water in the Caribbean, which makes all of the Beaches Negril resort included water sports even more appealing. 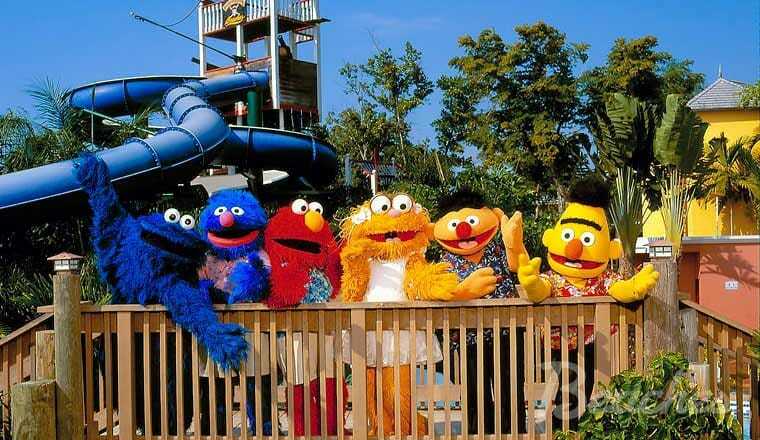 Prepare to be splashed even back on land! 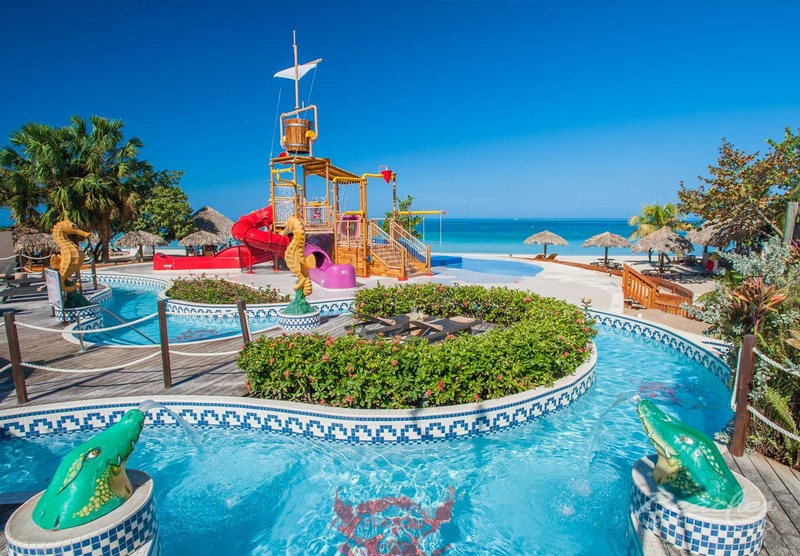 You and the kids will love the non-stop fun at Pirate’s Island, the Beaches Negril resort’s very own waterpark. A perfect family vacation! Slip down slides, sip cocktails at the swim up bar, and enjoy a jaunt down the lazy river. 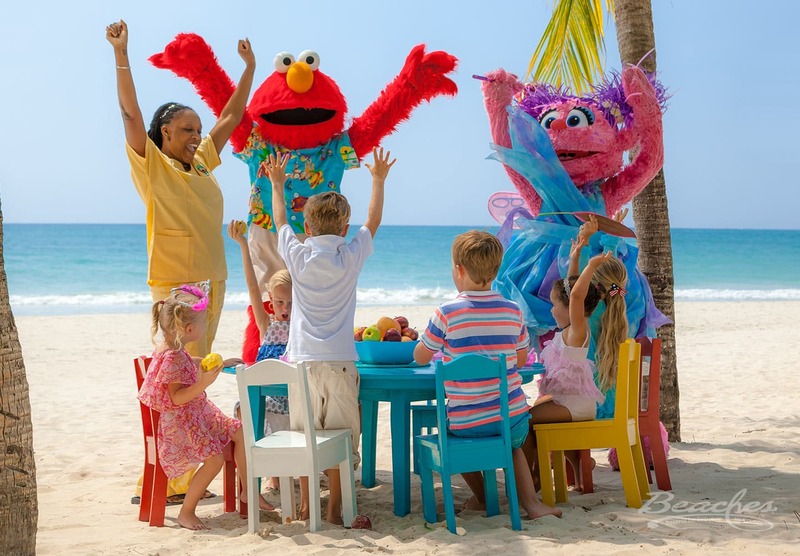 Beaches Negril employs caring, thoughtful staff who truly strive to make sure your children have loads of fun during kids camp. That frees you up to have a romantic dinner with your beaux, enjoy a relaxing massage at Red Lane Spa — or even dance the night away with your travel companions! At Beaches Negril, you get to enjoy family time and just-for-two romance. Beaches Negril truly has something for everyone … even your hard-to-impress teens and tweens. 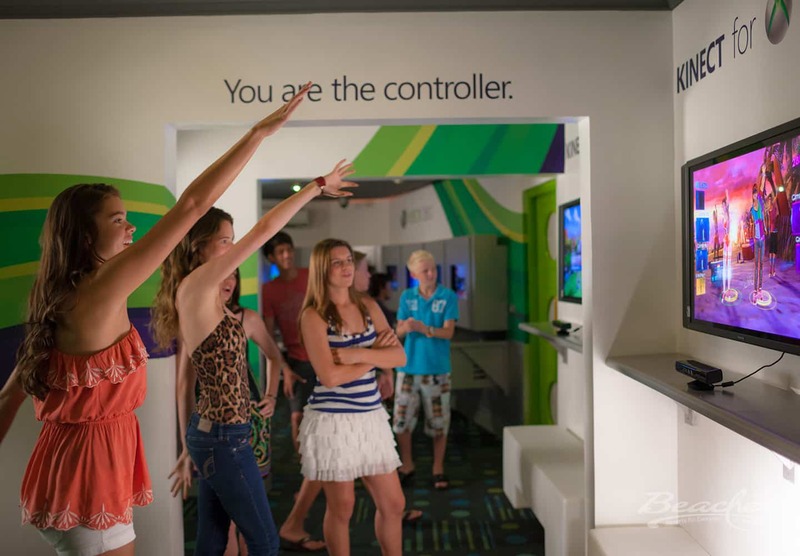 Teens can chill together at Club Liquid, battle each other in the Xbox Play Lounge, and spin some hits at the Scratch DJ Academy! Also, this Beaches Negril family resort offers unique suite configurations, so your family can room together, while your teen or tween can feel like they have some extra space for themselves. If you’re dreaming of a warm, tropical destination wedding, Beaches Negril is the perfect choice. Since the Beaches Negril resort welcomes families, you can tie the knot with all your loved ones, no matter their age, at your side. Plus, if you meet certain group room minimums, you can take advantage of Beaches Negril’s “WeddingMoon” — a free destination wedding and honeymoon suite! Get a Big Step Closer to Your Dream Family Vacation! Whether you’re looking for the ultimate family getaway or a truly romantic vacation — or a combination of the two! — the Beaches Negril family resort is your answer. Ready to start planning the memory-making vacation to Beaches Negril that you’ve always dreamed of? Our Southern Travel Agency team in Augusta and our online travel agents can’t wait to help you! Get in touch to start turning your travel dreams into reality today! Book Your Beaches Resort Stay on Your Own! Truly Pamper Yourself: Let Our Travel Experts Build Your Own Dream Vacation Now!